We’d love your help. 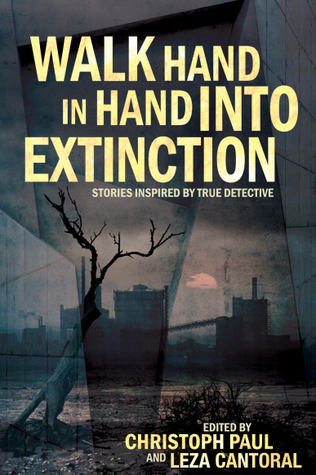 Let us know what’s wrong with this preview of Walk Hand In Hand Into Extinction by Christoph Paul. To ask other readers questions about Walk Hand In Hand Into Extinction, please sign up. Could read this book again and again, even if there were some typos! To be fair, I didn't actually finish this book, I just abandoned it. I desperately wanted to like this book as I loved the first season of True Detective. I loved the spooky, somewhat X-Files feel of everything surrounding The Yellow King and Carcosa. And that's probably the best part about this book, that all of the stories touch on The Yellow King and Carcosa. But, that's where my enjoyment stopped. All of the stories are, to me, weird and unresolved. They all just sort of end, like a piece of To be fair, I didn't actually finish this book, I just abandoned it. I desperately wanted to like this book as I loved the first season of True Detective. I loved the spooky, somewhat X-Files feel of everything surrounding The Yellow King and Carcosa. And that's probably the best part about this book, that all of the stories touch on The Yellow King and Carcosa. But, that's where my enjoyment stopped. A mixed bag for me - some good, some great, a lot of just okay. I wanted more from a book based on a series I love so much. Frustrating. Interesting collecton taking inspiration from a great TV show.